Had to carve out 20 minutes or so to drop by a thrift store while on vacation. 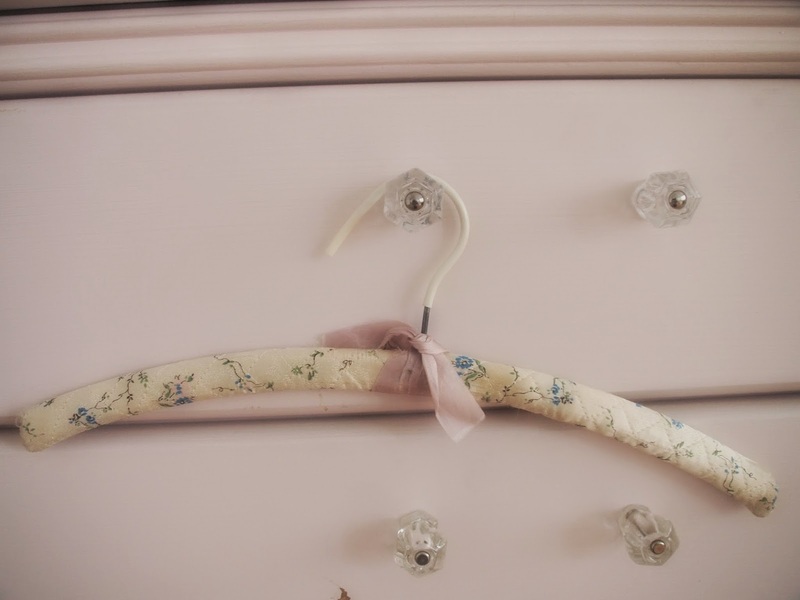 Am glad I did, as I now have a new little vintage hanger to add to my collection. This little hanger was .25 cents. Made my day! Just goes to show that you don't have to spend a lot to garner joy and satisfaction from thrifting. Little pink and blue flowers. So lovely! Love the vintage ribbon as well. Here it is hanging on my shower rod in vacation cottage. Can't wait to add it to my collection. .
We are spending a bit of time up at our vacation home on the coastline. So nice to be back! Went walking on the beach this morning. Here is a pic of our little cottage and a pic of my hubby and I. So glad to be back at our "cottage by the sea". Love it up here! 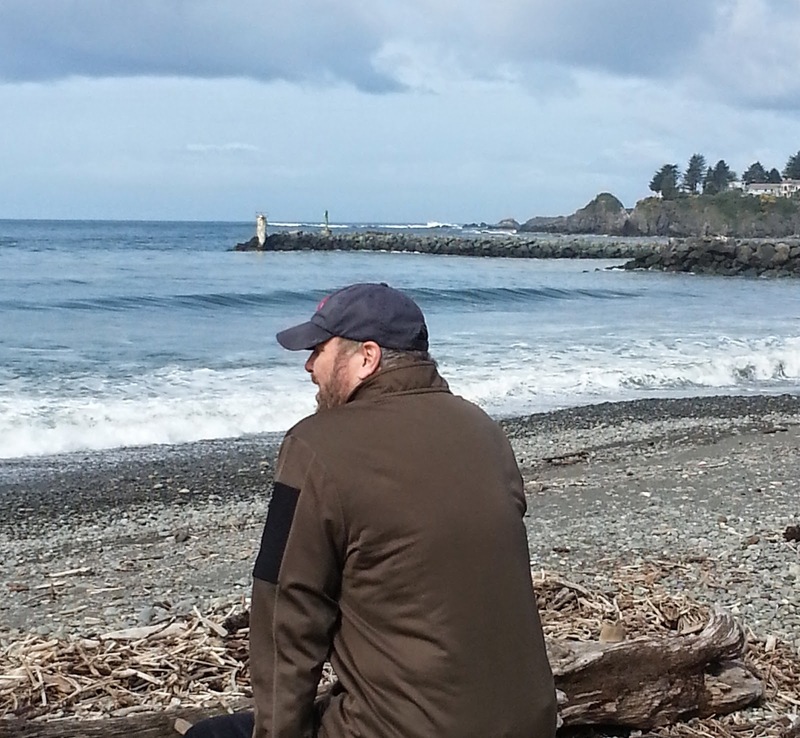 Hubby, enjoying the ocean waves! We went walking early this morning. Was a bit chilly. Am all bundled up! On Saturday, I popped into a thrift-store that I often frequent. In the back of the store, sat two slip-covered chairs (slightly soiled & a bit askew) with the cushions lying separately on the side. When I asked a worker how much these chairs were, my jaw dropped when he said "you can have them for $5.00"). One of the chairs is an IKEA (Ektorp), and the slip-cover alone sells for $159.00 on their site. I liked the IKEA best, so initially just bought that one. I took it home, and then thought......I was crazy for not buying the other chair as well so went back for it. I treated some spots on the slip-covers with stain remover, and washed them with a little bleach, detergent and cold water. They came out beautifully! Am posting some pics below, including a pic of the receipt. (As who would believe they could possibly be $5.00). They are so comfortable and so shabby chic! Think I will put them in our TV room. This is the IKEA (Ektorp) chair. Love it! Here are both chairs together. They are just so comfortable! The slip-covers just pop off for easy care. I have not purchased gift- wrapping paper from a retail store in years. I prefer all the beautiful vintage paper that I find at thrift stores. I often find brand new packages of 2 or 3 sheets for .15 to .50 cents. My craft-room is stocked! While I prefer the beautiful sets within my color palette, I usually buy silver, gold, cream and neutral colors for the guys in my life. Here are some pics! Love both vintage paper and ribbon! Who wouldn't love to receive a gift wrapped in such pretty paper! One of my favorites: "You are precious in His sight". Wrapped Catherine's Birthday gift in this last year. She loved it! Couldn't pass up this wedding paper! Love, love love vintage paper and ribbons! Just wore one of my favorite tops again this week. Love that it's so perfect for winter/summer/any season. I picked it up at the thrift store a couple years ago. It was a "meant to be" kind of moment when I stumbled upon this beautiful pink leather tattered bible while thrifting. As you know, my bible featured in prior posts is covered in vintage wallpaper and is filled with satin ribbon home-made book-marks...marking my favorite verses. I plan to fill up this bible in the same manner. Just love how old and tattered the pink leather binding is. Here are some pics! Already filled up with book-marks! Soft leather binding.......and pink! Love!! I write out family history, dates, birthdays, etc. in my bibles. And love to mark them up......especially highlighting favorite verses etc. Love that it is old and tattered.....adds to the character! Old Bibles are easy to find in thrift stores. To me they are just beautiful! I have been feeling extra spiritual/religious lately, so when I found this beautiful cross at the thrift store I was very happy. Love finding beautiful things at the thrift store to decorate my apartment! The other day I posted a pic of my first rose of the season. This morning, walked out into the garden, and there were several other blooms. Now, am in heaven with all the fresh flowers in our house. Love Spring-time roses! I love these International themed vintage glasses. They feature the coat of arms for different countries. I purchased 6 for a quarter each! Love this pin! I am 100% Scandinavian. To be precise, 50% Norwegian and 50% Swedish. The word UFF DA,....often used in response to a less than desired outcome, is one that has always been a big part of my vocabulary. i.e.) UFF DA!...........I'm only half done. UFF DA!..........The rain is really coming down. etc. etc. etc. Anyway, when I found this pin while thrifting, I was over the moon! It has a special place on my inspiration board. With the warm weather we have been having in CA, we now have several budding garden roses. Here is a pic of the first one of the season. Love walking out into the garden to cut a fresh rose! Happy Springtime to all! One of my favorite little lamp shades is this one made of blue glass. I found this at a thrift-store in Brookings, Oregon. It is vintage. Am using it now on my little marble desk in family room. Catherine and I are crazy for Doris Day! In honor of her 90th Birthday today, am posting some pics of a few of Catherine's classic Doris Day albums. Catherine purchased all of these at thrift stores. Have been listening to her music this afternoon. So fun! Also, read a recent interview on DD that was released today. 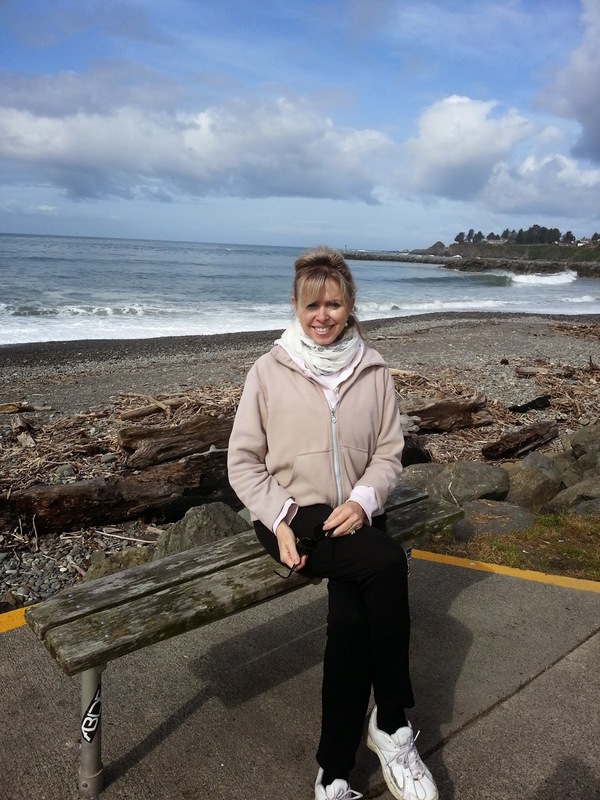 Doris still lives in Carmel by the Sea, is involved with animal rights, and is happy as can be just walking on the beach and gardening. What a wonderful life she has had. Happy 90th Birthday Doris Day! The photo and graphics on this album are just beautiful! "The Magic of Doris Day"
What a beautiful voice she has. This album features duets performed with Andre Previn! I purchased this authorized biography of Doris Day a few years ago at thrift-store for .50 cents. Enjoyed every minute of it! I gave the DVD collection of Doris Day movies to Catherine for Christmas. All of her movies were just so classic and fun as well!